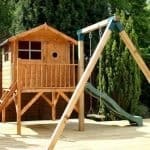 By putting the 7 x 5 Waltons Honeypot Poppy Tower Wooden Playhouse With Slide into your garden you are giving the kids a good reason to stop watching the TV, put down their game controller and have fun outside. This is a playhouse that just has so much to offer. To start with to get into it, the children have to climb up a ladder. Then they have a lovely little decking area, complete with railing. From here they can either go into the playhouse or fly down the awesome fun slide. There is even enough room for them to play underneath the playhouse. There is just so much going on here that the kids are going to be able to have fun with this for many years. Waltons have made sure that this is going to be a playhouse that lasts for many years. They have done this by using a strong frame that sits behind some lovely looking tongue and groove shiplap cladding. The floor and roof have been made using solid sheet boarding and even the decking is impressive as it is made with tongue and groove boarding. Even though this is made with very robust materials, Waltons have made sure that this is child safe and it has actually been TUV tested and it passed with flying colours. 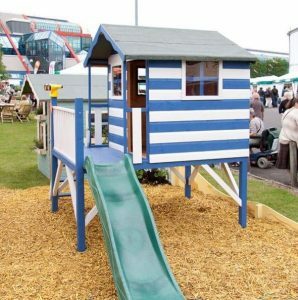 The 7 x 5 Waltons Honeypot Poppy Tower Wooden Playhouse With Slide is one of the most impressive looking and high playhouses we have seen from Waltons. It has just such an interesting and unique look that it is near impossible not to be impressed. The kids have a lot of room to play inside the playhouse as the width is 4 feet 1 inch and the depth is an impressive 6 feet 8 inches. 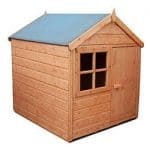 This along with the very generous amount of headroom make this a very spacious playhouse. 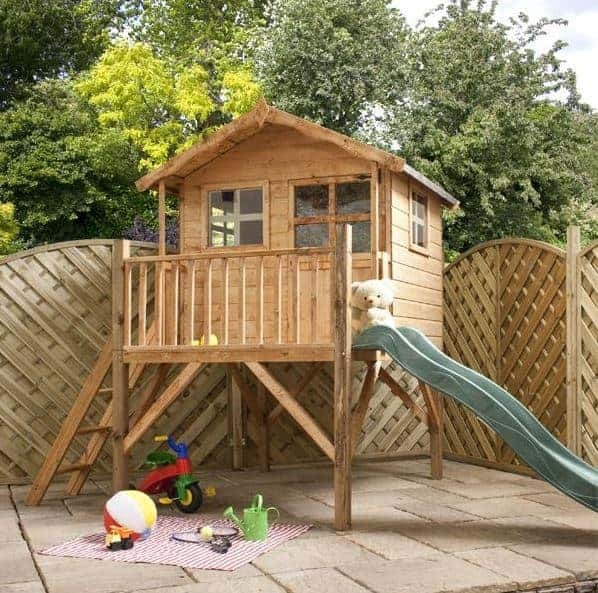 With this being a tower playhouse the kids need a way to get up to it, Waltons have made sure this is fun and safe by using a solid and child friendly ladder. On the decking area which is around 3 feet off the ground, there is a very attractive looking railing to stop them falling off and if they do not feel like taking the ladders back down then they can take the slide. The slide is going to be very popular and we are sure you will have a smile on your face as you see them repeatedly climb up the ladder, go down the slide over and over again. The slide is bound to see teddies, trucks, dolls and even the dog be sent down it. This is one of the highest structures we have seen from Waltons. At its peak the playhouse is 8 feet 7 inches high. The roof is made with solid sheet boarding that is around 8 mm thick and then is covered with some roofing felt to keep the boards safe from rain and snow. All of the timber used to make this playhouse has been planed and smoothed and this is most evident in the cladding. 12 mm thick tongue and groove shiplap cladding will keep the rain out and is of course the main thing that gives this playhouse such a nice look. A look that is so impressive, you will no doubt be wondering why the kids have a playhouse that looks better than your very first flat. Waltons have made sure that no matter how much fun the kids are having that the playhouse can take it. They have used a very solid frame that is 28 mm x 28 mm and at the corners is actually double framed to give it even more strength. So no matter what kind of wild and fun games are going on inside here, do not worry the playhouse can handle it. Solid sheet boarding is used for the floor and this is similar to what is under the roofing felt, but Waltons have made sure to use boards that are a little thicker here. No matter if you have a few girls doing their Frozen dance moves or a couple of rowdy boys pretending to be Iron Man and The Hulk, this floor is able to take that kind of weight and craziness. Outside the playhouse, the decking area is made with some very appealing tongue and groove boarding which is something we really like. A free tub of wood treatment is provided with this playhouse and that is a good thing as all of the timber needs to be treated. This 5 litre tub of golden brown wood treatment is more than enough to coat the whole playhouse. Just make sure to remember to do it again the following year and the wood will stay rot free. 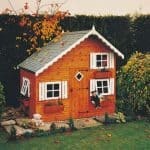 Waltons give a ten year anti rot guarantee with all their playhouses, but in order for this to be valid, you have to treat the wood. So the kids can drag a whole lot of their toys inside, Waltons have made sure to use a good sized door. This door is 3 feet 6 inches high and 2 feet wide this is quite large a child’s playhouse so we are very pleased with it. 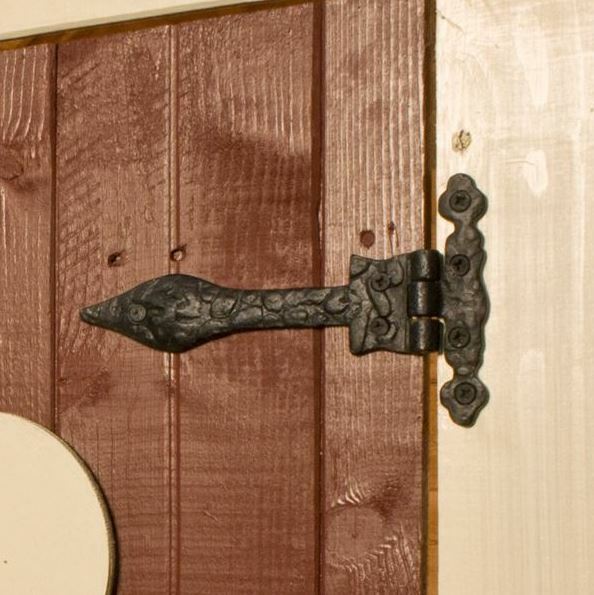 Keeping this door in its place are a couple of strong hinges and also to make sure there are no accidents of them hurting their fingers in the door, there is a small gap around the frame to prevent this. The 7 x 5 Waltons Honeypot Poppy Tower Wooden Playhouse With Slide has four Georgian style windows that are made with 2 mm thick shatterproof styrene. One of these is actually located on the door and is a little larger than the rest. We then have one on each side and another on the front. 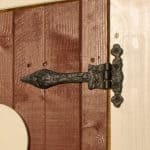 We feel that this is a very secure structure and while it does not come with any way to lock the door, you will be very pleased with how secure this feels. Adding a lock could easily be done, but just remember you will be the one who has to always unlock it when the kids want to play. Privacy is not something that this really offers, but we seriously doubt the kids will actually care. They will be too busy having fun inside here to notice you watching them play. However if you do not want the neighbours to be able to see inside or even if the kids just want a little privacy then adding some curtains or even a set of blinds would be something to think about. As is the case with other Waltons playhouses this one pretty much comes as it is. To be honest as it looks just so fantastic, we really do not see this as a problem and we are sure your kids will have all kinds of fun design ideas that they will do. 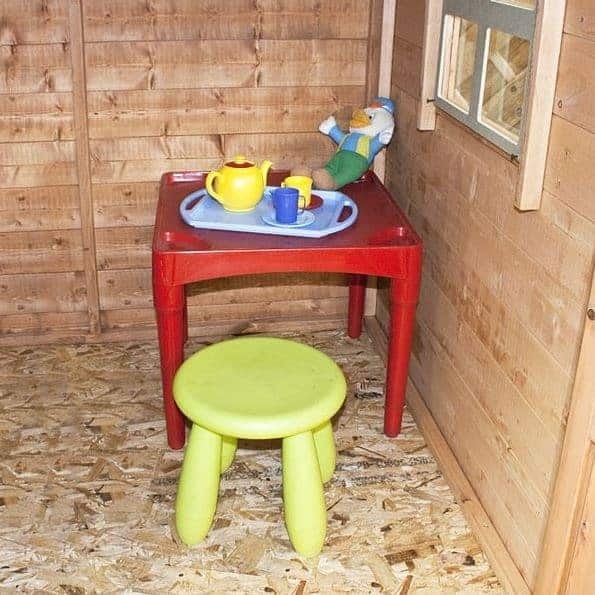 Toys on the decking, a little table inside and maybe even something underneath. A huge part of the fun for a child is making this their own little space. We do have a few extras to tell you about such as the installation service. 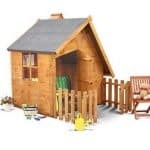 This costs £199.99 and will see them install it once they have delivered the playhouse. For an extra £34.99, you can upgrade the roofing felt to a thicker, 10 mm olive green superior felt. The last extra we have is this fun kitchen playset that will cost an extra, £49.99 and allow the kids to make Paddington Bear some marmalade sandwiches or even whip up a protein shake for Captain America. 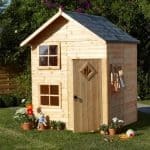 This is a very high quality playhouse and actually we think that you can tell this from the first moment you lay eyes on it. While you will need to coat the timber with wood treatment. Waltons have used these materials because of how robust they are and their ability to take whatever the kids can throw their way. No matter if they are playing in the playhouse, under it, on the decking or just going up and down the slide, there is plenty of areas here to have a fun time. Due to the size and the different sections of the playhouse, you will certainly want to make sure you have a friend to help and that you follow the instructions. This will take quite a while to build, around 5 or more hours, but the end result is well worth it. 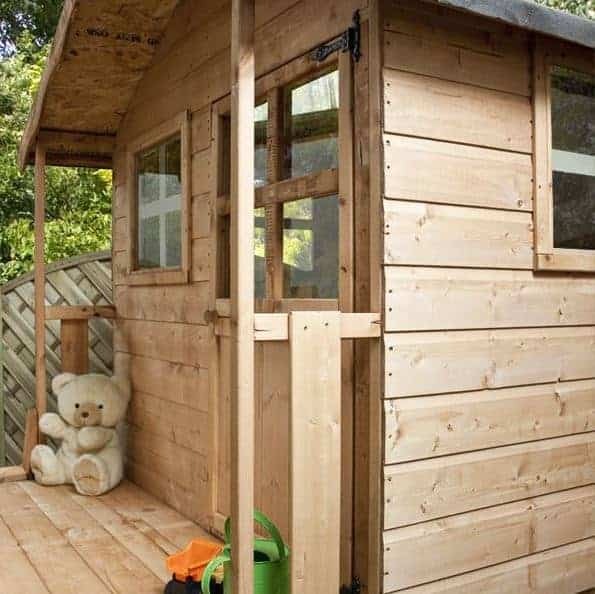 This playhouse offers excellent value for money with the amount of things that it offers, the good look and of course the long lasting materials used to make it. 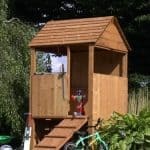 Final Thoughts: The 7 x 5 Waltons Honeypot Poppy Tower Wooden Playhouse With Slide is a fantastic playhouse that is well made, looks amazing and it is going to last many years. 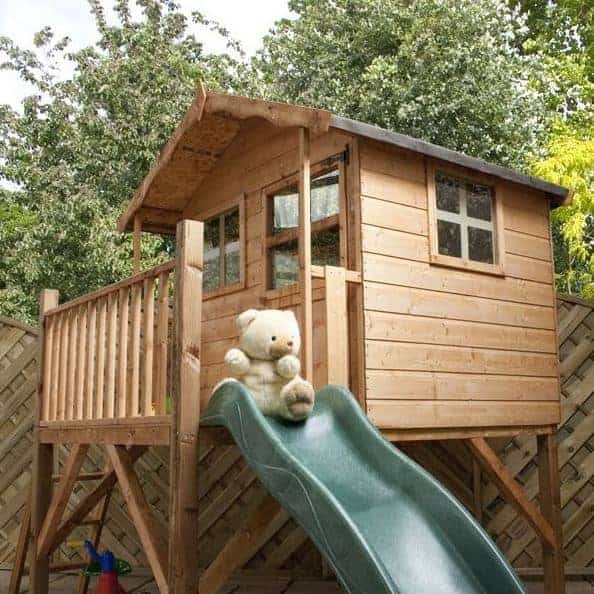 It really does offer everything a child could want in a playhouse. The kids will have the time of their lives with this and we are sure you will have a smile on your face while you watch them play. It is a little pricy, but when something is as high quality and long lasting as this then paying a little extra we feel is always worth it. This playhouse can be bought without the slide, but at only an extra £30, we feel the slide, if you have the room for it, is worth the money.